The fields of Old Pool Farm in Schwenksville are anything but quiet. Volunteer work crews scurry from task to task, and the din of hammering and circular saws echoes across the rolling fields. Alisa Landes is one of 200 music fans donating time to stage the 53rd Annual Philadelphia Folk Festival. She cites it as "...the largest volunteer-based folk festival in the country." She&apos;s been here since July 4, but by the time the festival kicks off August 15-17, she will have 2,500 colleagues, all supporting the same goal: Provide for 60 music acts across six separate stages in front of 40,000 fans for four straight days. Tasks are broken down by 36 committees, and as Personnel Manager in charge of Purchasing, Landes has a clear overall view. "We think of everything," she says. "Or at least, we try to. We have to. We adjust, change, revise, based on what works the prior year or what doesn&apos;t."
Fest is the veterans&apos; term for the annual folk music celebration in Schwenksville. With 15 years&apos; service, Landes clearly has earned the chops to refer to it as Fest. Organizers see to every aspect of the experience: ticketing, parking, security, medical, food, water, supplies, merchandise, technical, vendors - even the quirky things a performer may want in the green room. Landes walks me through the preparations. Under a pavilion, the graphics committee maneuvers around buckets of open paint and dripping brushes. "We give a fresh look to our signs every year," Landes says. "We don&apos;t re-use anything from the year before. It all gets redesigned and repainted." We walk across the lawn and down to the stage. I stand where the performers will play and look out over the hillside. It&apos;s deserted now, but it&apos;s easy to imagine thousands of fans cheering the acts and swaying in time to the music. Behind it, across a small footbridge, is an area for children&apos;s programming. "This is the coolest part place in all of Fest," Landes reveals. "People string hammocks between those trees and just take it easy here for a while." Presentations in this grove include the Give and Take Jugglers. "They&apos;re my favorite," Landes admits. "And they are the nicest people!" Other family fun includes storytelling and puppet shows. "We want to put family at the forefront," Landes says. "We want to make it a safe and good experience for everyone. Sometimes the kids just get antsy at the main stage - four days is an awful lot to ask of a toddler - so they can come down here for something just for them." 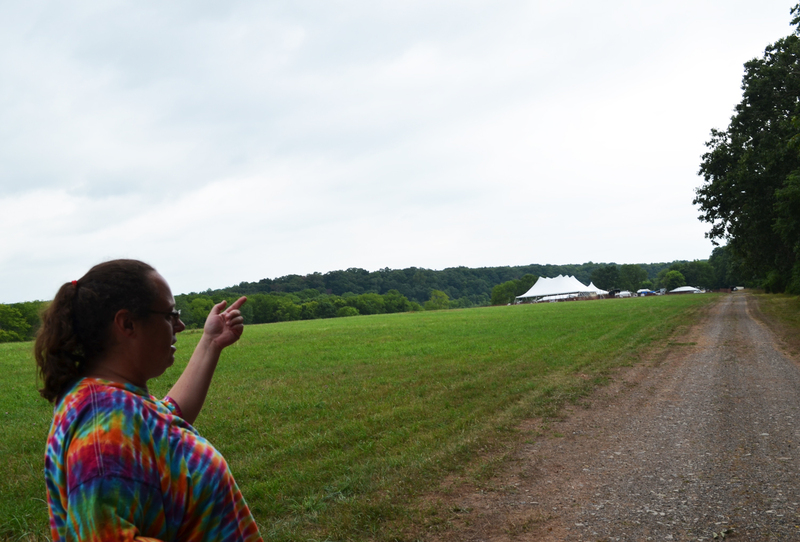 At the camping area, Landes points out a break in the tree line. "The Perkiomen Creek is right down there. People go to swim or bathe, especially when the heat gets to be too much." Hydration is key, so fresh well water is pumped to water stations all across the property. 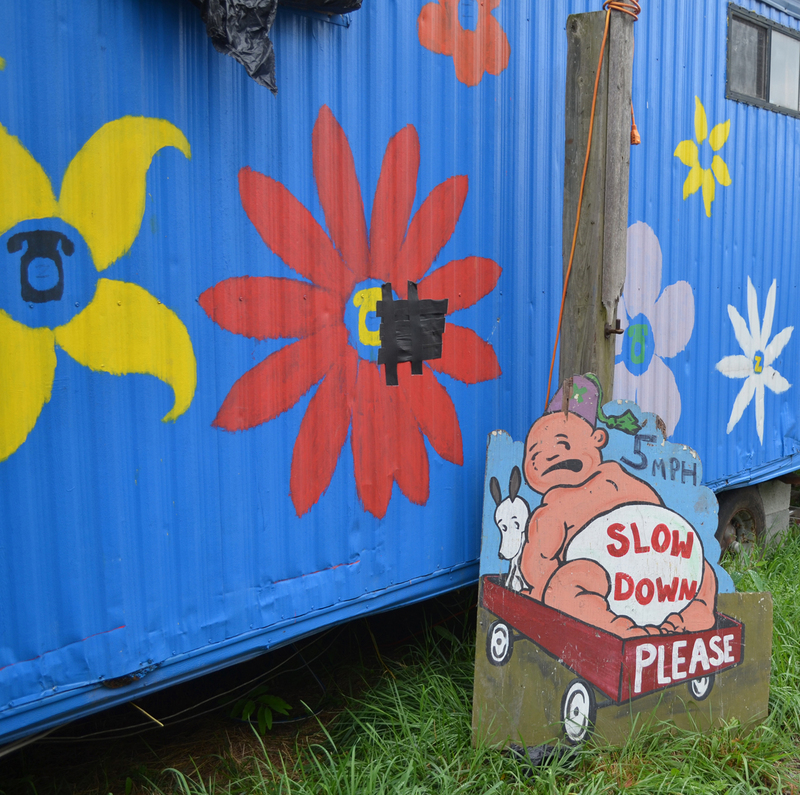 Although there are no plumbing or electrical hookups for campers, the Fest organizers try to provide as many amenities as possible "We open a General Store, where people can purchase things they may have forgotten. And the porta-potty providers also bring portable showers. A ticket gets you five minutes, but it&apos;s better than nothing," she laughs. Philadelphia Folk Fest is a rain-or-shine event. "We&apos;re here for four days each August," Landes laughs. "You can bet there&apos;s going to be some rain at some time." Issues arise, though, only in extremes. Onstage, all the equipment, including giant screens that skirt the stage, are weatherproof. 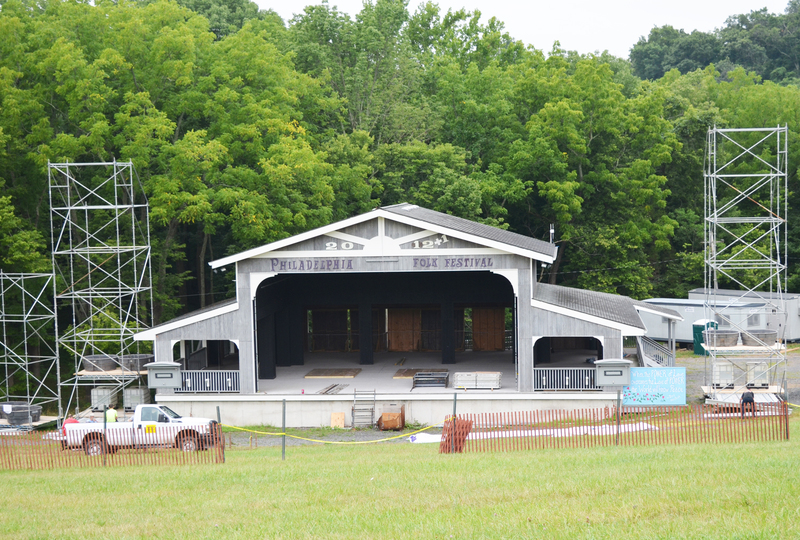 Once the concerts, demos, workshops and informal jam sessions are over, the property is cleared and returned to its original purpose: an 80-acre hay farm. The site belongs to the Godshall family, whose two residences are easily seen from the campsites and who traditionally attend the concerts. "When it&apos;s all over, there&apos;s a little sadness," Landes admits. "We&apos;ve spent the whole summer together. And we won&apos;t see each other until next summer. So there&apos;s definitely a feeling of saying goodbye to family when it ends." Her career as a preschool teacher for Early Head Start in Pottstown allows her the freedom to spend her summers with Fest. The families that have sprung up around this music event have deep roots. Landes&apos; husband, for instance, is a life-long attendee, having grown up nearby. "His mother tells the story that Fest got him to give up his baby bottle. He dropped it in the mud one year and never went back to it." The headliners for the 2014 edition of the Philadelphia Folk Festival is Old Crow Medicine Show. Prominent artists such as Bob Dylan, Tommy Smothers and Bonnie Raitt have been known to drop in unexpectedly for a session or two. Camping onsite is a large part of the Philadelphia Folk Festival, but there are other options. If a hotel room is more to your liking, our website has detailed listings. And although the taste of open campfire cooking is something to be savored, the Garden Grille & Bar is happy to provide just as much flavor, while doing the work for you.